The follower is Operation Thunderbold. 7.04 points at 24 votes (rank 339). 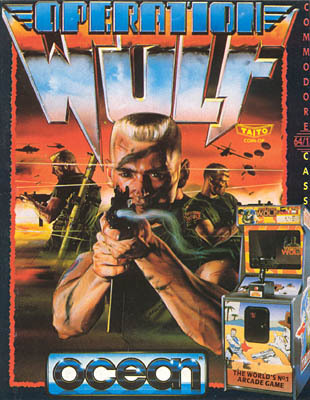 Operation Wolf is the conversion of the arcade machine game with the same name from 1988. 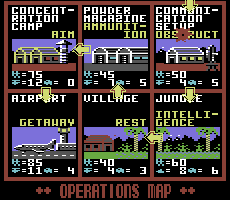 This game was one of the first ego shooter games: The backgrounds scrolls from left to right while helicopters, tanks and soldiers appear from all sides and shoot at you. 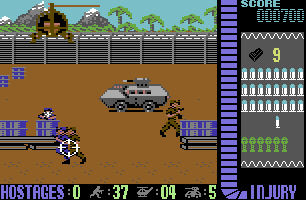 Brand-new for this time was that you play the game from the first person perspective and the enemies shoot directly out of the screen at you. Ocean has made a great C64 conversion that does not need to hide behind the arcade machine: The game is pure adrenaline! As ammunition there is a limited number of magazines and grenades available. 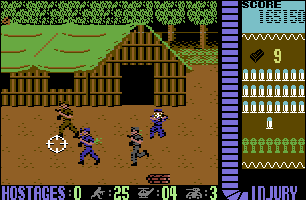 More supply appears sometimes at the lower border of the screen and can be picked up by shooting it. The aim of the combat mission is to free the captives and indemnification of their safe evacuation. The game has 6 levels. 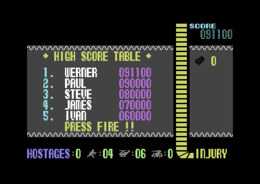 The game offers horizontal scrolling. 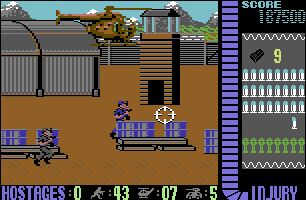 In the right area of the screen are displayed: the current score, the number of magazines left, the number of rounds in the current magazine, the number of grenades and the injury bar. At the very bottom, the number of enemies that need to be eliminated to rise to the next level is shown. There are different versions with bugs known. Nostalgia: no bugs known, several trainers, intermediate screens, because it is the US version, but nevertheless works on PAL and NTSC. Dynamite: when shooting this all visible enemies and civilists are killed. Fire: when shooting this you can fire for 10 seconds without using ammunition. Grenade: when shooting this you get an additional grenade (max. 5). Magazine: when shooting this you get an additional ammunition magazine. Power: when shooting this your own life power is raised. Do not fire permanently or your ammuntion will be empty very quickly. At the end of each level spare a tank and first stock up your ammunition. Then eliminate the tank. The Nostalgia version from 2011 contains several trainers (see below, Links). 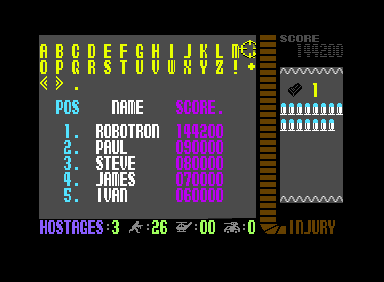 Robotron2084: "Although many features fell by the wayside in this conversion - shootable animals, soldiers with bullet-proof vests or bazookas, Ocean has succeeded in a for 8-Bit means rather competent conversion of the arcade machine. The experienced friend of shooters is covered with a curtain fire of breathless action that leaves you in a daze in over 6 levels. Contributing to the high difficulty grade to a discernible extent are the horribly unprecise joystick controls and a likewise doubtful collision query that both can make for lots of frustration. The idea to let the crosslines speed up when you move it over a longer distance was really suboptimal. 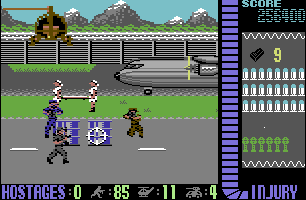 Also the boldy pixelled sprites do not really cause storms of enthusiasm, for this the streched armoured vehicles, helicopters etc. look too cheap. How far you get in the game does not only depend on your own ability to handle the catastrophic controls but also on the mood of the game to give you an energy extra in a critical moment. Yes, you have seen that right: Unfortunately, luck is also required in this game, you can swirl the joystick as artfully as you want, if the game does not coorporate it is over in level 2. Period! But it nevertheless motivates you again and again to return and finally crack it and somewhen after long suffering the long sought for success arises. 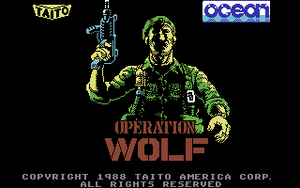 Operation Wolf is a good, but sometimes frustratingly difficult piece of action with bad flaws which needs much practice and patience. I give 7 out of 10 points - without the awful controls 9 points would have been easily possible." TheRyk: "For sure, a really good game of the late 80s, no complaints about great music and graphics. 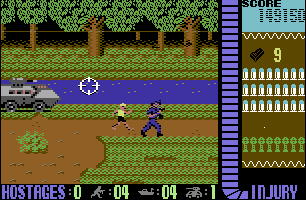 A good sense of humour is also there, the jungle joggers' appaearance is just hilarious in a war scenario. Controls could be a little more 'calm', the goodies less random; three times first aid or grenade in a row doesn't really help if the bullets in your last ammo clip are numbered already for half a minute. Thus, it's getting really difficult. Including 1 point for mouse support, I rate this one 8 points, for there are not many games with meaningful mouse support and in my opinion it really plays slightly better with mouse." 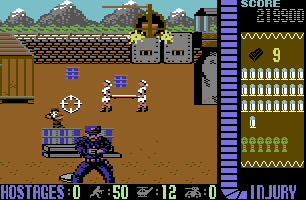 The clone “No Mercy” was published on the Golden Disk 64 07/1990. 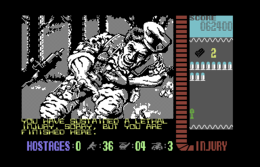 The game was awarded the British Golden Joystick Award in 1989 in the category Game of the Year and Best Coin-Op Conversion of the Year. The "Continue click" that is possible in the game once, is allowed. Points that were reached through a bug should be deleted in all fairness. This page was last modified on 3 March 2017, at 15:36.